Rocco Lovero and Jillian Monsrud monitor master control operations for the Digital Convergence Alliance. The secured data center in Jacksonville, Fla., is fortified to withstand major storms and electrical outages. As public TV engineering leaders navigate their stations through the post-auction channel restructuring and the looming transition to ATSC 3.0, they’ll be re-evaluating the future of their master control facilities. Moving to a joint master control has been an option for five years, and now there are three different facilities catering to public TV stations — Centralcast, based in Syracuse, N.Y.; Public Media Management, a joint venture between WGBH in Boston and Sony; and the Digital Convergence Alliance in Jacksonville, Fla. Operators of each facility argue their model represents the most economically viable future. During this week’s PBS TechCon meeting, they’ll be talking up their advantages in helping stations prepare for ATSC 3.0. Serving stations in markets as large as New York, Boston and Dallas, and as small as Plattsburgh, N.Y., and Pullman, Wash., the three facilities now account for close to half of all public TV viewership nationwide. Current spoke with each of their leaders to learn more about how they’re competing for business — and, in some cases, cooperating. WCNY-TV’s March 2013 move to its new studio building in a gritty industrial neighborhood west of downtown Syracuse was also opening day for the joint master-control center just behind the lobby on the ground floor. WCNY President Bob Daino also oversees JMCO [Joint Master Control Operating Co.], the WCNY subsidiary that operates the center for Centralcast LLC and just marked its fifth anniversary as the oldest of the three master-control centers. Starting with all of the public TV stations in New York state, linked by an existing state-run fiber-optic network, Centralcast now operates 85 streams of programming for 28 stations, plus the national Create service, Daino said. “One hundred million Americans, when they flip on their TVs watching PBS, all the way to Hawaii, 4,700 miles away, are getting services from us,” he said. Centralcast bills itself as a “lights-out” provider. Stations using the service can shut down their local master controls. Operators in Syracuse completely take over to handle program ingest from PBS and other network services, play out those programs alongside local material and encode multiple program streams for transmission. They also monitor the quality of the streams as they’re sent out via over-the-air transmitters, cable and satellite. “We’re giving them a full-blown opportunity to outsource to a real partner,” Daino said. 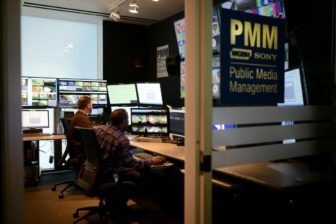 Overlooking the Massachusetts Turnpike, a mile from Fenway Park, the high-profile studios of Boston’s WGBH conceal a different sort of master-control provider: the joint venture between WGBH and Sony known as PMM. Launched in 2015, PMM takes the “Media Management” part of its name seriously, said WGBH Chief Technology Officer Stacey Decker. Scott Shactman and Tomarr Sanders at work in Public Media Management’s operations center at WGBH. While it provides transmitter monitoring and encoding for a few of its stations — citing privacy issues, PMM won’t disclose how many clients it serves — the Boston center functions differently from its two competitors. Instead of serving as a full-fledged master control using fiber connections to local stations, PMM depends on Amazon Web Services’ cloud to deliver files to nodes at each client station. Those nodes then play out programming into local master controls that can insert local live content. For WGBH and PMM, that means a strong focus on content, which is where Decker said Sony’s role in the partnership provides an added bonus for clients. “Just recently we’ve added 20 Sony movies to our library for our PMM clients to use, which is done for free on behalf of our stations,” he said. That includes a cloud-based archive system, unique to PMM, that allows stations to store their content in PMM’s servers. Decker said that’s a big advantage for stations that want to stop supporting older tape- or disk-based archive systems locally. Rather than having to manually retrieve that content locally, he said, PMM stations can easily pull their own archived content back into their schedules using the Myers ProTrack media management system. Detroit Public Television was one of the first clients to join PMM three years ago. President Rich Homberg said the station looked at all the master control options and chose PMM because of its technology and leadership. In the years since signing on with PMM, Homberg said his station has had no issues with outsourcing content management to Boston. Digital Convergence Alliance, Jacksonville, Fla. While it received an initial CPB development grant in 2011, at the same time as WCNY, WJCT-TV in Jacksonville took a little longer to get its joint master control up to speed. 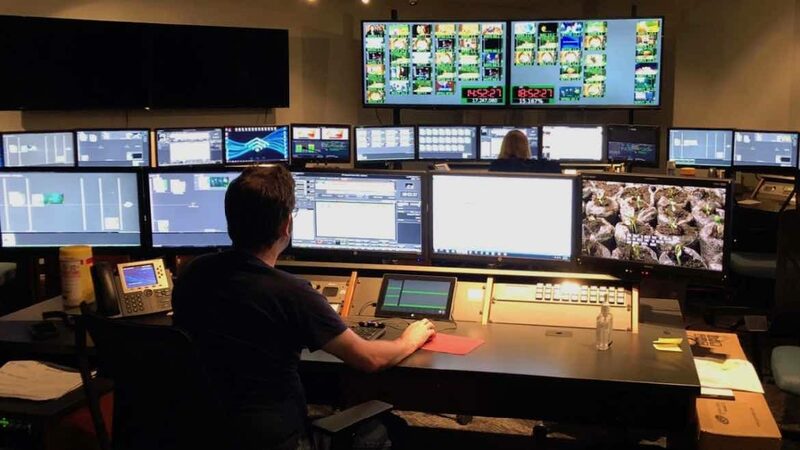 In 2012 WJCT took on master-control operations for Orlando’s new WUCF-TV, which signed on as the first pubTV station to be built without its own local master control. It took until 2014, though, for WJCT to move both master controls out of its building near the Jaguars’ stadium into the new DCA network operations center. It is the only one of the three master-control centers to be located outside its parent station’s facility. With an eye toward Florida’s severe weather, DCA built its master control in a data center across the St. Johns River. It’s well-stocked with backup power and with a much higher level of security than a typical TV-station building. COO Tony Alicea boasts that the power at the data center has never shut off since previous owners opened the facility in 1978 — and that there was no disruption during the last few hurricanes that ravaged the Florida coast. DCA started full operations in 2015 with 11 stations, including most of Florida’s pubcasters as well as WTTW in Chicago, KERA in Dallas and a few others around the country. Its growth has been slow but steady, with its most recent addition, WFYI in Indianapolis, joining DCA in February. Born out of the same CPB-supported planning process that created Centralcast in Syracuse, DCA’s architecture in Jacksonville is similar. Fiber interconnections to its stations allow for the same sort of “lights-out” local operation, with operators in Jacksonville providing what Alicea calls “high-touch” service, in frequent contact with local stations wherever they may be. “We always answer the phone by the third ring at worst,” he said. For all their differences, executives at all three facilities sing a common tune about their capabilities to help stations confront the uncertainties of the upcoming transition to the ATSC 3.0 broadcast standard. In addition to ultra–high-definition 4K video, which all three say they’re ready to support, Daino said preparations for all of 3.0’s features cover a wide swath of technology. “You’re going to want to support on-demand streaming, seamless integration into the internet, enhanced public safety applications for alerts on mobile and device wakeup, and the ability to deliver pledge-free content to members,” he said. In Jacksonville, DCA is deploying new encoders from its technology partner Harmonic, Alicea said, allowing several member stations, such as WEDU in Tampa, to broadcast multiple HD subchannels even ahead of the ATSC 3.0 transition. Daino said joint master controls like his in Syracuse make ideal partners for equipment vendors looking to test new gear for ATSC 3.0 and other developing technologies, allowing them to try out their equipment across a broad range of stations all at once. With the spectrum repack now underway, all three centers are gaining experience in supporting channel-sharing. Each now hosts at least one of the “zombie licenses” pubcasters have been acquiring. In Syracuse, Daino said he’s already taken an option on space in an adjoining building in hopes of adding commercial TV clients to his roster of pubcasters. In Boston, Decker said the repack consumed the attention of potential clients in 2017, making it a slow year for adding new clients to the PMM roster. All three centers are ramping up their efforts to make 2018 a busier year. In Jacksonville, Michael Boylan signed on as a marketing consultant to DCA after retiring as general manager of parent station WJCT; at WGBH, Decker said he’s talking to a whiteboard full of potential clients; and in Syracuse, Daino said advances in technology mean the center he designed to support 200 streams of video can now handle more than 550 without any increase in its physical footprint or power consumption. “It’s sort of mind-boggling how fast the technology is moving,” Daino said. That argument is at the heart of the very similar sales pitch all three operators will be making to potential clients at PBS TechCon in Las Vegas, in what all acknowledge is a “long game” of ongoing conversations to get stations more comfortable making the switch. No matter how persuasive the sales pitch from joint master-control operators, many public broadcasters still see value in retaining local control. NET in Lincoln, Neb., conducted extensive research three years ago. Chief Technology Officer Ling Ling Sun and her team visited all three public TV master-control centers as well as several of their commercial counterparts. They later decided to retain NET’s local master control at its headquarters on the edge of the University of Nebraska campus. The complicated nature of NET’s operations would have been hard to outsource, according to Sun. In addition to overseeing NET’s own television programming and more than a dozen transmitter sites spread over hundreds of miles of rural Nebraska, the Lincoln staff also handles NET’s network of FM radio signals as well as live sports broadcasts, streaming and broadcasts of state legislative sessions. Because NET in Lincoln is also home to the PBS Disaster Recovery, Diversity and Maintenance Site, which backs up the main PBS control center in Virginia, Sun said the facility had to remain locally staffed 24/7, which would have limited cost savings from moving to a joint master control. “If we outsourced master control, it would only have outsourced one part of what we were doing,” she said. At WGCU in Fort Myers, Fla., Kevin Trueblood, assistant GM for technology and operations, staffs his master control with a combination of two full-timers and students. Switching to an outsourced facility wouldn’t save much money, and it would give up the level of local control Trueblood now enjoys. “If someone screws up, I can correct them or fire them,” he said. And a local master control at his small-market station also has tangible benefits when it comes to impressing potential donors. Stations using PMM On Demand can access content using their existing master control technology.